Posted June 21st, 2018 by Mary Ann Hooper & filed under Past newsletters. Better by Bus meeting notes. Previously circulated to many but here’s a reminder. 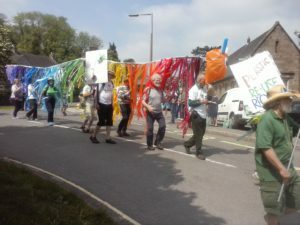 Some of us went to the anti-fracking demonstration on Tuesday 19thJune held to mark the start of the planning inquiry for an exploratory well for shale gas in Marsh Lane, near Eckington. Not only do we not want any more fossil fuels to be exploited [for the sake of the climate; there are now many scientific studies that conclude that fracked shale gas is contributing to climate change ] but also we deplore the over-riding of the wishes and decisions of the local people. Ineos referred this planning application to the planning inspectorate because they decided the county council were taking too long to give a decision. [The county council voted against the application but their decision will, I suspect, carry little weight]. The government, however, is still intent on forcing shale gas and fracking on English citizens, will probably take these decisions out of local control altogether and is considering make exploratory wells a permitted development so that no planning application is required! Chesterfield Transition is running a campaign to get Derbyshire County Council to divest their pension fund from fossil fuels. Because it is now accepted that fossil fuels contribute to climate change, their use must decline and therefore they represent a poor investment. Please write to your county councillor [for most that will be irene.ratcliffe@derbyshire.gov.uk, especially if you receive, or will receive in the future, a DCC pension. Derby City Council have already voted to divest their pension fund from fossil fuels. The group organised another successful Give or Take event in April, where many useful items found new homes, many were taken to charity shops to raise money for worthy causes and most of those items which were unsuitable for reuse were recycled. Members of this group and the Activists ran a stall at the Earth Day event held by the Eco Centre, Stone Centre and Mount Cook Adventure Centre, also in April [22nd]. We obtained a display about waste and recycling from the county council and produced tips for reducing plastic use as well as publicising Transition Wirksworth. Several interesting conversations took place though footfall was disappointingly low. Maybe next year…. The Transition Wirksworth walking float for the carnival at the end of May was organised by members of this group and our colourful caterpillar was paraded though he town with the help of Transition members. Thanks to those who took part. Derbyshire Dales District Council provides a weekly collection of food waste through the kerbside food caddy. But 35% of the content of the grey household waste bins which are sent to landfill, is recyclable food waste. They would like to know what would encourage you to recycle more food waste. Please answer a few questions on this subject in their online survey and be as honest as possible; all responses are anonymous. The survey will end on 3rd July. Cromford WI has produced a Cromford Cuts Plastic flier in which they mention Transition Wirksworth. Thank you for this, Janet Chambers. Success for Wirksworth eco housing group! 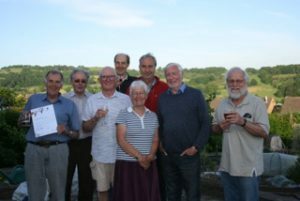 WTCLT steering group: from L to R: Dave Brown, Brian Hebron, Noel Mayes, Peter Walton, Mary Ann Hooper, Kevin Mann, Derbyshire Dales District Councillor Mike Ratcliffe, Ivan Dixon. The Charities Commission has granted charity status to a local community led housing organisation, the Wirksworth Transition Community Land Trust (WTCLT). It was started by the Wirksworth Transition Energy Group to provide energy efficient low cost rentedhousing for residents of Wirksworth and Middleton. In July 2016 a public meeting was held to gauge community support. The group heard concerns about local young people being out– priced and unable to continue to live in the same town as their families. As a result a steering group was formed to set up the Community Land Trust as a charity. The next step will be to hold a public meeting in the near future to explain the project and to recruit members (only £1 one-off fee) who will elect a Board of Trustees, enabling the project to remain accountable to the local community. Saturday, July 21st: visit to Whistlewood Common, near Melbourne in South Derbyshire. We will leaving Wirksworth Market place at 9.30am and arrive back by 5pm. Car shares available. We will have a tour around the 10 acre site and see their straw bale round house (under construction), permaculture planting and wildlife areas. We’ll each take contributions for a shared picnic lunch. There are hot refreshments, shelter and a compost loo! Please take cold drinks / water as Whistlewood is off grid. We’ll have the chance to join in their volunteer activities for the day: tree mulching, pruning, planting the living roof for the shelter and roundhouse – it all depends what our physical abilities are, everyone will be able to take part in some way. We will need your name and the number of people coming with you, and whether you would like a lift or can offer spaces in your vehicle (if so, how many?). Please also give your phone number for contact on the day and any particular mobility / health matters we should make Whistlewood aware of. There is no charge for this visit but donations are welcome! Saturday June 30th: Little Green Men – a play suitable for all ages. 7.30-8.30 Free event at the Stardust. Bring a picnic and something to sit on. Saturday July 14th: Wam Bam Band. From 6pm. Ticketed event. See local publicity. Sometime in August: Nature Walk with John Attiwell. Free event. Friday August 31st: Bat Walk. Free event. Friday September 7th: Showing of Bladerunner 6pm onwards. Ticketed event. Saturday September 8th: Stardisco. 6pm onwards. Free event. End of June 2018 Newsletter. Next newsletter will be early September 2018. Thanks for the newsy newsletter. Very useful. I just enjoyed filling in the DDDC survey on food waste because I hardly ever have any and it made me feel virtuous! Thanks Mary Ann. Keep polishing that halo! we look forward to meeting you at Whistlewood.